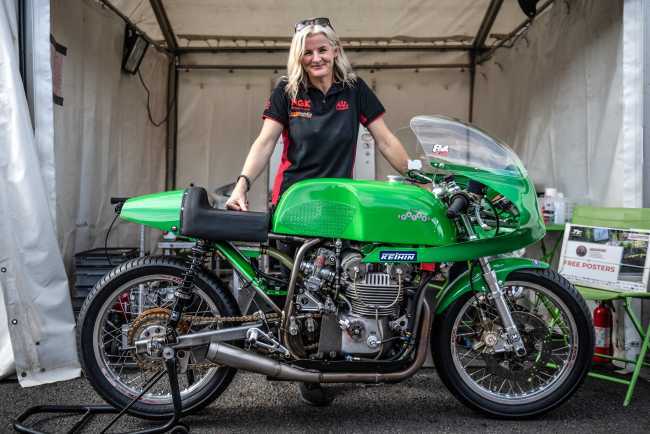 Maria Costello MBE returns to the Isle of Man looking to build on her impressive performances of recent years in the Bennetts Senior Classic TT. The Northamptonshire racer made history at the 2016 event when she became the only female racer ever to earn a place on the Classic TT podium alongside winner John McGuinness, while last year she claimed fourth, missing out on a podium spot by only seven seconds. She hopes to put the recent disappointment of the Ulster Grand Prix Supertwins race, that was abandoned due to bad weather, behind her when she competes on the beautifully prepared Beugger Racing Paton around the Isle of Man TT course. Costello had gone to Northern Ireland with high hopes after her Kawasaki ER6 Supertwin had received an updated loom and other performance modifications including a new larger Dymag rear wheel and Metzeler tyre, thanks to Chris from Dynopro. “We went to the Ulster in the strongest position we’d been in all season, with new mods and a new mechanic, thanks to Mark Coverdale. So it was very disappointing to be unable to use these improvements and get a good result at one of my favourite road racing courses, but the organisers made the right decision as the conditions were appalling. Costello has already completed a successful first practice lap on the Beugger Racing Paton at the Classic TT. In deteriorating conditions, Maria went second fastest, behind John McGuinness, with a lap of 102.03 mph. “The bike seemed to know it's own way round and I felt really at home on it, I can't wait for the next practice session! I'm so fortunate to be competing on this bike again, I can’t thank Peter and Barbara Beugger enough for this opportunity and I also want to extend those thanks to Richard Bairstow who works as the crew chief of the team. ," she added. Costello will also race on a Honda 350 for the first time for the Goathland Garage Team in the Junior Classic TT. Maria arrived at the Isle of Man fresh from a successful test of yet more classic machinery, this time for BMW Group Classic who have prepared a 1938 Supercharged BMW handshift, she will compete on at the Goodwood Revival in September. To buy tickets for the Goodwood Revival go to their website here. For all of the latest news on Costello, including sponsorship opportunities, news, track days and other events, please visit her website.